Happy New Year!! this year got off to a lazy start for us... we had planned on grocery shopping today, but forgot that the place we shop at would be closed! so, we ate at our fave restaurant, Grandma's, instead :) did you guys do anything fun today? 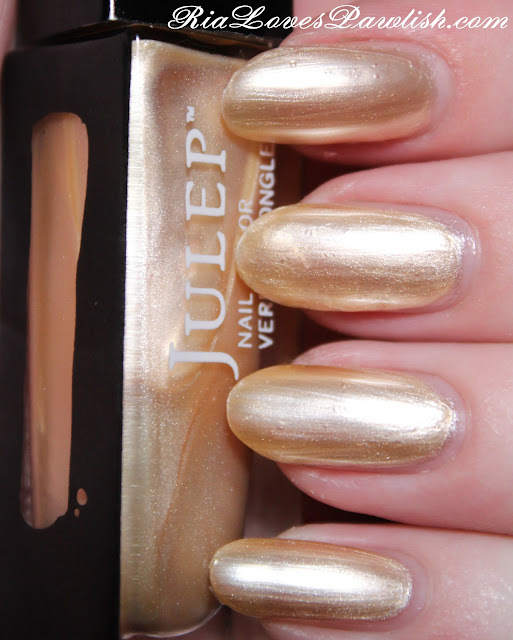 today's polish is Julep Amelia. it's a light golden cream colored frost... that i wanted to love! and i did love it in the bottle. the formula is quite thin, requiring three coats to be fairly (but not completely opaque) and it wants to bubble. it dries down to a true frost finish, quite streaky... and while i usually like frosts, this one doesn't do it for me. i would definitely add topcoat, it helps smooth it out a bit and pop some bubbles! three coats Amelia, one coat Seche Vite. Mr. Pawlish and i just watched 'Pitch Perfect' that he got me for Christmas... i love that movie! we're watching the extended and deleted scenes now... it amazes me how much gets cut out of movies. usually it's stuff that doesn't matter, but occasionally there's something that would have made something in the movie make more sense! I don't much care for frost. This one isn't too bad, I suppose. I just don't like how they show so many imperfections in the nail. I really love Amelia. I just put it on, two coats and one of Seche Vite. It didn't bubble much at all for me, but is streaky. I found you looking for a swatch of Julep's Leslie, and I like your blog. And I'm jealous, I want Pitch Perfect on DVD so badly. I listen to the soundtrack over and over again. Amelia did grow on me more throughout the day :) thank you so much for reading my blog!! you should definitely get Pitch Perfect, it's one that's really rewatchable!